Overview: Red Pocket Mobile (888-993-3888) is a Mobile Virtual Network Operator (MVNO) that began operating in 2006 using the AT&T Network. In December, 2013 Red Pocket added new plans and service that use the Sprint CDMA network. The Sprint based service is sold as "Red Pocket CDMAS". The AT&T based service has been rebranded as "Red Pocket GSMA". 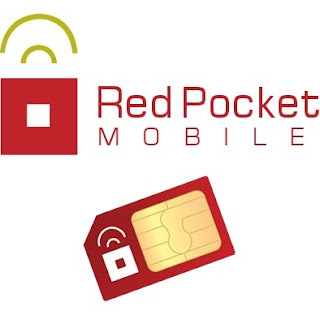 In Aug, 2014 Red Pocket added "Red Pocket GSMT" service on the T-Mobile network and "Red Pocket CDMA" service on the Verizon network. Red Pocket GSMA uses AT&T's 850 and 1900 Mhz network with UMTS, HSPA+ and LTE data support. A 3G capable device is required as AT&T shut down their 2G network at the end of 2016. Red Pocket GSMT uses the T-Mobile network with HSPA+ and LTE data. GSMT plans were discontinued effective 6/6/15 and reinstated 2/1/16. Red Pocket CDMAS uses Sprint's network with support for 1xRTT, EVDO and LTE data. Red Pocket CDMA uses the Verizon network with support for voice and 1xRTT, EVDO and LTE data. 3 Unlimited data at 2G speeds after 3 or 10 GB. 4 For a "limited time only" $35 plan includes 5 GB of high speed data for GSMA customers only. 5 For a "limited time only" $65 plan includes 12 GB of high speed data for GSMA customers only. 1 GB: $25.50 for a single month, $127.50 for six months ($21.25/month), $204.00 for 12 months ($17.00/month). 3 GB: $29.75 for a single month, $153.00 for six months ($25.50/month), $255.00 for 12 months ($21.50/month). $60/year ($5.00 month) - 100 minutes, 100 texts and 500 MB data. $99/year ($8.25 month) - 500 minutes, 500 texts and 500 MB data. $179/year ($14.92 month) - 1000 minutes, unlimited texts and 1 GB data. $205/year ($18.33 month) or $69/90 days ($23/month) - unlimited minutes and texts, 1 GB data. $220/year ($18/month) - unlimited minutes, texts and data first 5 GB at high speed (AT&T and Sprint only). $249/year ($20.75 month) - unlimited minutes, texts and data, first 2 GB at high speed. $360/year ($30/month) or $99/3 months ($33/month) - unlimited minutes, texts, 4 GB data. $399/year ($34/month) unlimited minutes, texts and data, first 10 GB at high speed. AT&T and Sprint only). $499/year ($42/month) unlimited minutes, texts and high speed data. AT&T and Sprint only). Except as noted above, the eBay plans are available on your choice of any of Red Pocket's four networks. Free SIMs for GSMA, GSMT and CDMA is included with the initial purchase of any of these plans. CDMAS SIMs are available on request. International Rates: Red Pocket Unlimited plans include unlimited calls to 72 countries. Data and MMS (picture messaging) does not work "out of the box" with iPhones on Red Pocket GSMA. There's a configuration tool at goredpocket.com/configure that makes it relatively easy to get iPhone data working. Enabling MMS requires jail breaking. Red Pocket GSMT works with any T-Mobile phone, including iPhones. Unlocked non-AT&T GSM phones will also work provided they support the 1900 Mhz band. BlackBerrys, Palm OS, WebOS and push to talk phones. Boost Mobile, Sprint Prepaid and Virgin Mobile phones must be used for 12 months on the service they were sold for before they can be activated on Sprint MVNOs, including RedPocket CDMAS. Red Pocket CDMA works with clean-ESN (not reported lost or stolen or blacklisted by Verizon for non-payment) Verizon branded phones. Verizon Prepaid phones do not work unless they have been used on Verizon Prepaid for 1 to 12 months as specified on the phone's packaging. How to Activate: Activate Red Pocket SIMs and CDMA accounts online at http://goredpocket.com/activate/ or by calling 1-888-993-3888 from another phone. You can port in a number from another carrier during activation on the website or by calling in. Payment Options: PIN codes or cards are available on the Red Pocket Website and from authorized Red Pocket dealers. PINs can also be purchased at a discount from callingmart.com and other online retailers. You can top up a Red Pocket account with a PIN code, PayPal or a credit or debit card at goredpocket.com/easyrefill or by calling 611 from the Red Pocket phone or 1-888-993-3888 from another phone. On GSMA plans you can also add a PIN by dialing *111* + PIN number + # + Call on the mobile phone. Account Management: Users can check their cash balance, available messages and data and add funds at goredpocket.com/refill. Call records are not available from Red Pocket..
Red Pocket Pros: coverage, BYOD, inexpensive international voice and messaging, international direct dialing. Support for call waiting and 3-way calling, multi-lingual customer support. Red Pocket Cons: no call forwarding, no detailed call records. Last updated May 18, 2018 - New $399 and $499 annual eBay plans added. If you do a lot of Intl texting,(about 2500 a month) like I do, and you use over 5000 minutes a month ( like my teenage daughter) none of AT&T MVNO's is competitive with AT&T itself, which charges $50 a month for truly unlimited everything. Their MVNO's will cut you off if you use that many minutes. I recommend Red Pocket's $60 unlimited talk/messaging/2 gb data plan over the other mvnos as they offer less data (H20: 1gb. Air Voice: 500 megs) at the same price point. H20's CS is hit and miss. Jolt Mobile runs off of Red Pocket and offers 24 hour CS with almost no wait time. Quality of CS is similar but Jolt has much easier access. On the low end plans, Air Voice's $10 a month w/ rollover plan and $35 5000 minute/10000 text (nearly unlimited) talk/text plan are better deals and H20 has a $25 monthly plan w/2.5 cent minute/texts, 10 cent mms and 30 cent meg data plus a one year $100 option at 5 cents min/txt, 10 c/mms and 30 c/meg data. I have been corresponding with you on another page regarding AT&T’s GoPhone plans. As AT&T will soon remove the data add on for 2 of their GoPhone plans – I am considering Red Pocket’s $49.99 Unlimited Plan. Could you please advise whether there is any problem with my plan above. 2. What is the charge for receiving an international text? 3. What is the charge for receiving an international call? 4. Are charges 1-3 deducted from the $2 international calling credit? If not, how/where are they charged? 5. Do I need to cancel the plan before leaving the US i.e. will Red Pocket automatically charge me another $49.99 when the month is over? How do I cancel the plan? * Cheap calls and texts to/from Australia. * I prefer international direct dialling. * It would be preferable to be able to activate according to my plan above i.e. When I land at LAX, I will not have access to a payphone or the Internet, to be able to activate in that manner. In light of these factors – am I making the right choice with Red Pocket or would you recommend a different network or MVNO? I don't think Red Pocket's 611 will work with an unactivated SIM. You can reportedly activate the SIM on online from anywhere in the world, so you could do that before leaving Australia. I don't know if Red Pocket accepts non-US credit cards. I suggest you ask them using their online chat or email ([email protected]). If they don't the Red Pocket site accepts PayPal if that's an option for you. 1. International texts are 10¢/each to send. Strange as it seems, international MMS are free to send. 2. Receiving international texts is free. 3. Incoming international calls are free. 4. No, the international credit can only be used for outgoing international calls. 5. You can purchase a single month's service. As long as you don't set up automatic refills, there is nothing you need to cancel. I'm glad to hear that unlike AT&T, I can activate a Red Pocket SIM from here in Australia. 1. eBay sellers advertise their Red Pocket SIMs as "Unlimited", "Max" or "Micro" but they are all unactivated and without credit. My guess is I can buy any of these (maybe not to Micro) and set up the $49.99 Unlimited Plan - do you agree? 2. At the the time of activation - would I receive my US cell number? That would be handy, as I could give the number to people here in Australia before I leave. 3. As international texts are 10¢ each - how am I charged for these? Does the charge somehow come out of my $49.99? If so, does that mean I can send 499 international texts? I'm sorry if this is a silly question but I'm still unsure about this. 4. Previously I have used Red Pocket's Pay-As-You-Go-Plan and I was charged for incoming international calls. Is it correct that this is different for the Unlimited Plans? Sorry to hassle you about this, I just want to make sure. Does the $49.99 Unlimited Pan allow the 250MB of data for Smartphone users (as AT&T does not)? There are no handset restrictions on Red Pocket, the 250 MB is available with any device. Matt, I already responded to the exact same questions yesterday, except for #3 which I'm still waiting to hear back from Red Pocket on. I'm unable to read your response from yesterday - is it located on this post or another post? I will wait to hear back regarding #3. Hmm, I remember answering yesterday but now it's gone. Weird! So hear are my answers again. 1. Any Red Pocket SIM can be used on any plan. 2. The site will show your Red Pocket number when you activate. It will ask you for your zip (postal) code and give you a number local to that zip. If you want an LA number an LA zipcode is 90001. 3. I don't know. I've emailed Red Pocket. I'll update when they reply. 4. Incoming calls are all charged the same regardless whether they are local or international. The $49.99 plan includes unlimited incoming calls. The $49.99 Plan includes a $2 international text credit. This is in addition to the $2 international calling credt. If you need to send more than 20 international texts you can use a pay as you go top up to add a cash balance to the account. 1. On Red Pocket's website they're selling "One-Time" Refills known as "PayGo" Refills for $10/$25/$50/$100. Are those the ones you referred to above - which I want to buy if I need to send more than 20 international texts? 2. Is there any charge to receive a domestic or international MMS? I know I'm being pedantic - just want to make sure I understood you correctly. 1. Yes, the pay as you go refills are used to add funds to cover international texting on the unlimited plans. 2. There is no charge for receiving international SMS text message on the unlimited plan. In question 2 I was asking about MMS - are these still free to receive (both domestic and international)? Yes, MMS (international and domestic) are free top receive on the $39.99 and up monthly plans. A little while back, I got a lot of good information from you regarding Red Pocket's $49.99 Unlimited Plan. I have decided that is what I will use when I visit the States in September. I am travelling to the US with my wife and I had a thought that I could also get her a Red Pocket SIM (only $4.30 including shipping) - just so that I could call her when we separate i.e. when she goes shopping for hours on end! Could I simply activate her SIM without putting any credit on it and expect to be able to call her? If not, what is the minimum credit I need to put on her SIM - just so that I can call her (she doesn’t need to be able to call me)? There is no credit included with a Red Pocket SIM card. You would have to put sufficient funds on the account to cover one of the plans. The cheapest plans are the $20 monthly plan and pay as you go which requires a minimum top up of $25. Details of all plans are in the post. I bought an xperia mini pro 17a . i was wondering if this would be hard to activate i bought a 39.99 refill and a red pocket sim off of amazon for 79 cents. i get my phone next thursday. im planning on only using wifi for internet. Activating a Red Pocket SIM should be straight forward. It should be easy to configure up the APN and MMS settings on an unlocked Android phone like the Xeperia Mini Pro. I live in Australia and will be visiting the US in September. You have been answering lots of my questions regarding Red Pocket as well as AT&T. My Smartphone is a Hong Kong "fake" (something like a Samsung Galaxy). Using my Australian MVNO SIM - I must set "Data Roaming" to "On" before I can access the Internet here in Australia. When I use Red Pocket's $49.99 Unlimited Plan in the States - should I also set "Data Roaming" to "On", or could that lead to some horrific data bill (for roaming on another network)? Also, I already have my Red Pocket SIM. After inserting it in my phone here I discovered it was pre-programmed with APN and MMS settings but not the ones shown in this article (I think they were AT&T settings). I impulsively changed those settings to what you have recorded in this article and cannot get them back. Am I likely to have trouble connecting to the Internet in the States? I will take a printout of both Red Pocket and AT&T settings on my US trip - just in case. Red Pocket doesn't support roaming. There is no way they could charge you for to. You can safely turn the phone's data roaming option on if you need to. You will need to use the Red Pocket settings in order data to work. I am planning to use Red Pocket for the next two month. Can I tether the 2GB data plan on my laptop? I was decided to go with Straight Talk, but then found on their "prepaid operator profile" that they do not support tethering. Hope you can help. I've never heard of anyone having issues tethering on Red Pocket. In the same situation, I checked the Red Pocket Facebook page and one of the most recent posts (10 Oct 2014) is an exchange between RP and a customer who was apparently dropped for tethering. They cite their T&C section III. She was told by a pre-sales rep that using her phone as a hotspot was OK, but got dropped anyway. RP cited "abusive or improper use", so there may have been more going on. do you know how long takes the shipping? because i havent received any confirmation email. $40 unlimited talk & text. I know it is not unlimited. How many true minutes do you provide on $40. I've heard of Red Pocket cutting people for using too many voice minutes off. The limit seems to be somewhere between 5000 and 10,000 minutes. Except for Straight Talk/Net10, I think all MVNOs have a hidden cap on voice. If you plan on using much over 4,000 minutes, stick with a carrier with their own network like Boost, Virgin, T-Mobile or AT&T or else use Straight Talk or Net10 which seem to tolerate heavy voice usage. Has anyone had an issue receiving incoming calls and text messages after activation? What do you suggest doing? If you ported the number from another carrier it can take a day or two before the port is complete. If the problem persists it could be either a weak signal, bad phone or a problem with the Red Pocket account activation. I would rule out coverage or phone issues first. If possible, borrow a known good AT&T or AT&T MVNO phone and see if it works in the same area. It does try swapping SIMs to see if the problem follows the SIM. If it does call Red Pocket. Conditional call forwarding, as needed for activating Google Voice voicemail, is available. I don't think conditional call forwarding works any more. I get a bunch of error when I try to enable it. RedPocket is giving extra data for new $40-60 unlimited plan activations in July. 150-500mb, depending on the plan. It takes up to 7 days for them to add the bonus data. Red Pocket will be offering Sprint service soon. They will keep AT&T service. They will the only MVNO to offer multiple networks other than TracFone, as far as I know. I don't know what it means, but my "account status" showing on the website has been incorrect on Red Pocket for almost a month now after I had to have my service "reset" by CS last month. I don't think Red Pocket has a family plan. H2O does however. Can I use an unlocked tmobile phone that is reported stolen or lost? I dont see where it says that the data is throttled after 2.5 gb. I just see where it says 4GB of data. Also, their coverage map shows roaming. do they have roaming? "Unlimited does not mean unreasonable. All Red Pocket CDMAS 30 Day plans that feature Unlimited Mobile Web include 2.5GB of high speed data, including 4G speeds in 4G coverage areas for capable devices. Adaptive protocol video limited to 3G speeds. Customers exceeding 2.5GB will continue to have data access but maximum speeds may be reduced to 3G speeds of 256Kbps or below for the remainder of their 30 day plan cycle." Does anyone have an opinion about UpWireless? They appear to be a sub MVNO of Red Pocket. Their rates seem very good. I wonder if voice calls are transmitted over the cellular network like traditional calls or if voice calls are sent using VOIP? I have not used the UppTalk app. UppWireless resells RedPocket's T-Mobile based mobile broadband service. Calls and texts use the UppTalk messaging and VOIP calling app. See: All-IP MVNO UppWireless Offers Unlimited Talk and Text and 1GB of Data For $15/Month for details. GoRedPocket.com is not functioning.Blank Page. Red Pocket has useless customer service. They could not activate my phone and after hours with support trying to get the phone to work they would just leave me on hold and never come back I would have to call them back over and over again they even had me do a factory reset and wipe my phone and it still didn't activate and when I asked for a refund they refused. I gave up and switched to another MVNO and the same phone activated in minutes with no problem but I never got my money back from Red Pocket I payed for a service they didn't provide and they didn't seem to surprised that the service wasn't working. Red Pocket just took my money and never tried to make it right. Red Pocket is a rip off. Red Pocket has deleted reference to data for PayGo on their CDMAS Plans page. They could not get data to work on my iPhone, which worked with data on RingPlus. Other people have reported that data does not work on CDMAS PayGo. "Red Pocket CDMAS works with most clean-ESN ... Sprint branded phones with the following exceptions which are not allowed: iPhones,"
We use a Sprint iPhone 4S on Red Pocket. Thanks for the headsup. I've updated the post so it mo longer says iPhones are not allowed. Red Pocket - GSM[A] SIMs - $1 shipped. Do your phone have to be unlocked to use red pocket? RedPocket to offer 4G LTE Plans on Verizon Network ? Red Pocket GSMA Plan that is. Looks like it's AT&T only and no data. Still a good deal if the International calling works and you need it. Otherwise the Airvoice $20 plan is a better deal for unlimited T&T on AT&T. This might seem like a strange question, but can you use a 3G-only CDMA plan with a LTE CDMA phone? The reason I ask is because I don't use enough data to care about LTE speeds, so it would be better to save money and buy the $20 3G plan. My phone is LTE though and the Red Pocket website isn't clear on whether they force a LTE phone to buy the more expensive LTE plans. I use their PayGo on my Asus zenfone2 Laser. I never get LTE connection, I can only get H+. Anyone know why? Hard to say. Can you swap your SIM to another phone and see if you get LTE? That would rule out a phone defect or data settings issue. Any leaks on their Black Friday deals? Red Pocket - Taxes & Regulatory Fees? Are these new? Now Showing up everywhere on their site. Hi Dennis, I have 2 Sprint iPhones with LTE SIMs. It appears that Red Pocket offers Sprint service. Can I reuse my Sprint SIM to activate Red Pocket service? I am interested in the $30 monthly plan, is it true that I can save $5 with autopay? Thanks in advance! Yes, you can use the Sprint SIMs to activate on Red Pocket Sprint. The $30 plan is $25 with autopay. Thanks for the quick response! I have previously used the Sprint SIMs but discontinued service. Do you know if I can use unlocked Sprint iPhones on Red Pocket's Verizon network? Red pocket's $10/month plan comes with 100 MB of data, NOT 500 MB as shown in the table on this article. Red Pocket changed the $10 plan to 500 MB on their website on Friday and then changed it back to 100 MB on Sunday. I'm trying to find out what's going on with that. It must have been an early leak. I see they are back to 500 MB now. Under "Red Pocket Cons" you said that there is no way for users to check their balances, data used or plan expiration on the non-AT&T plans except by calling customer support. They do have a "Your RPM Account" page now which shows that info. I have their Essential Plan and there is no way to get this infornation except by calling customer support. I am using an ATT plan. No call forward on all networks ? I have tested my wife's Red Pocket on Verizon: both conditional & regular call forwarding works. She is on the 500/500/500 annual plan. But she can't call Canada which I thought was supposed to be available. Red Pocket's regular monthly unlimited plans sold on the Red Pocket website and by Red Pocket dealers include free international calling. The discounted eBay plans don't seem to, it's not mentioned in the eBay plan listings. Are the Amazon plans data hard capped? Appears the eBay plans data is not? Any current discounted deals/promos still avail.? Saw mention a few weeks ago. Currently the eBay and Amazon plans are all hard capped. In the past at least one of the eBay plans included unlimited throttled data but that's no longer the case. I'm not aware of any current discounts on the eBay or Amazon plans. The ebay 2GB, 5GB and 10GB plans are not hard capped. New annual plans on ebay. $399/year ($33.25/month) - unlimited minutes, texts and data first 10 GB at high speed (AT&T and Sprint only). $499/year ($41.58/month) - unlimited minutes, texts and high speed data (AT&T and Sprint only). I've added the $399 and $499 plans to the post. Thanks for the reminder. Red Pocket website is updated to say unlimited data on all the plans. $10 monthly unlimited on the network of choice is amazing! Not seeing it, no mention of unlimited 2g until $30 under plans. It definitely exists on the $10 and $15 plans. I saw it last night. I didn't go searching for it but it might be dependent on the carrier. In the past I've seen more "enhanced" options under the Sprint or T-Mobile carriers but I wouldn't go that route unless you only need service in the big city.